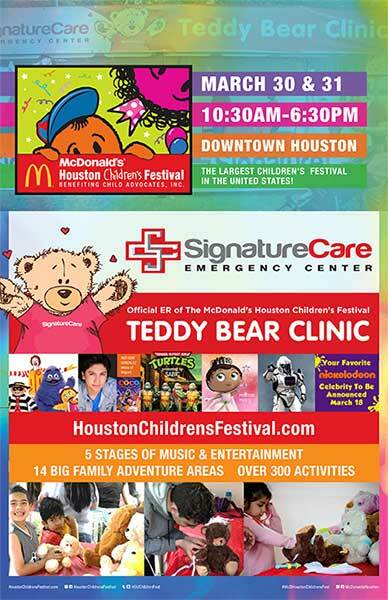 SignatureCare Emergency Center is sponsoring the Houston Children’s Festival this year and you are invited. We are preparing a Teddy-bear Clinic for your little ones to enjoy so come on out and join us. See Also: Join SignatureCare Emergency Center at the 2019 Westchase District Corporate Challenge. The Houston Children’s Festival is the largest children’s festival in the United States. Spread out over 4 city blocks in downtown Houston, it features live music, games, giveaways, food from local Houston vendors, beloved costumed characters from TV and movies, and even Anthony Gonzalez, the voice actor for Miguel from the Disney/Pixar movie “Coco”. The children’s festival will take place on March 30 and 31, from 10:30 am to 6:30 pm. Tickets are $14 if purchased at the gate, or $13.67 on Eventbrite when you buy online. There is a $2.00 discount if you present a McDonald’s receipt, a military CAC or DD214 at the gate. Children under 3 get in free. Proceeds from the festival benefits Child Advocates Inc, a non-profit organization that advocates for the rights of children in foster care or legal disputes. SignatureCare is the official emergency room of the Houston Children’s Festival and we’re incredibly proud to be a part of this event, so please come out and show support! We hope to see you there!